Silverlight is new technology by Microsoft for rich content display on the web. It is a main competitor of Adobe Flash player. Many a times you would have seen prompt to install Adobe Flash player to watch online Videos. Well in coming days you may see prompt to install Microsoft Silverlight to watch online video content. NBC Sports and Microsoft are working together to build NBCOlympics.com with the help of Microsoft Silverlight platform to deliver deeply immersive user experience. ApplÃ‚Â plug-inÃ‚Â is under 2MB in size & works with leading browsers. 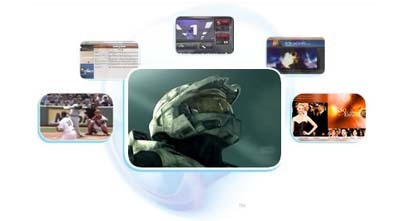 Delivers media experiences & rich interactive applications for Web. Even Microsoft Website’ Download section is based on Silverlight Platform. This will surely beÃ‚Â a must have add-on in days to come. In case you want to install Silverlight later, you can surely download Silverlight Wallpaper. They have made one very good logo and of course wallpaper!